So Weird‘s second season is loaded with confidence, which is one of its most attractive features. By building on the foundations laid in season one, the show begins weaving more intricate character stories while also feeling brave enough to tackle the more classic myths (of both the historical and scientific variety) that define this genre of television, especially The X-Files. The season premiere featured mediums, while other episodes take sirens, banshees, trolls, and werewolves (not to mention an upcoming vampire episode, which is perfectly in the vein of Dracula) for a ride on the Phillips tour bus. The classics continue to roll in this week: “Fathom” finally plays the mermaid card, acting as a complement to “Siren,” while the title gives away the primary focus of “Roswell,” the infamous July 1947 incident that played into a nation’s growing Cold War paranoia. So Weird bites into both with appropriate vigor. The merman is played sufficiently subtle. Lal Nereus, played by veteran TV actor Rick Ravanello, is built as a man of mystery and intrigue, a laconic construction of abs and facial expressions designed to be appealing to Molly. In this way, the show tackles a common question with single-parent characters on television through an uncommon method, namely a romantic archetype who just happens to be part-fish. As has been made apparent throughout the second season, Molly really misses Rick, and when Lal turns out to be almost too good to resist, she readily takes him up on a date offer to the aquarium. The episode balances Molly’s romance scenes with Jack’s newfound skepticism, which he expresses to a bemused Fi and Carey. (Fi and Carey spend their time in a two-scene plot in which Carey “helps” Fi study for an unspecified college entrance exam. Fi is about as amused by Carey’s antics as Irene was when she found out Carey dropped out of college.) Jack is mostly acting on a hunch from meeting the guy, at least until he gives Molly a pearl (you know, from a clam… maybe.) The story culminates in Molly meeting Lal at the pier, where he intends to completely reveal himself as a merman and take Molly away, while Jack finally Googles “Nereus” and stumbles upon a website about the merfolk. The script for “Fathom” could have robbed Molly and Lal of their agency. It would not have been the first time (though for “Siren” the lack of agency for Callie was basically the whole point of the story), but it would have been disappointing, selling out Molly’s agency for a one-off monster showcase. Instead, when Lal insists that Molly run away with him because “we don’t have to be alone anymore,” she rejects him, pointing out that she still has her kids. At this point, Jack runs up, having learned the truth about Lal. In the ensuing struggle, Jack gets knocked into the water by Lal. Recognizing his mistake at last, Lal saves Jack from drowning, then, defeated, departs for good. The show, to this point, has been good with letting its teens have romance (“Roswell” reminds the audience of Gabe, who will have an important indirect effect on the show soon) but Molly’s close encounter is a reminder that, because of what happened to Rick, the regular mortal struggles of his family are enhanced by the oncoming flood of strange and lonely beings looking to bring Fi’s search to a rough ending. “Roswell” also could have been self-indulgent. After all, a show that deals in extraterrestrials at any point deserves a shot at one of the most famous alien conspiracies in American history. But the show finds an unexpected avenue to follow in exploring the events of July 4th, 1947: through the son of the military officer that recovered the U.F.O. In fact, so reverent is “Roswell” to its source material that the opening, which is usually given to Fi explaining the myths and stories surrounding the episode’s Paranormal Event of the Week, instead shows the incident on the night of July 4th, 1947 in order to set the stage, with Fi only telling the audience the time and place. It’s the beginning of a melancholy but engaging episode of television as Molly and Fi decide to help Andrew, an old man they meet at a gas station outside of Albequerque, hitch a ride back home. Andrew appears to be hearing voices, and his sister Becca is very cagey when Fi sees the date of an old family photo (Roswell, New Mexico; July 1947). Things get weirder when Molly has one hell of a trippy dream where an alien reaches out to her with his thin, bony fingers, which makes her more inclined than usual to believe in Fi this time around. 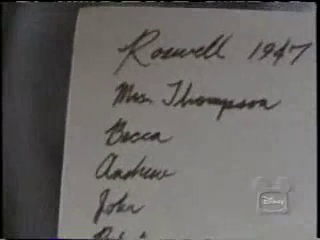 But for all the episode’s pursuit of “the truth” about Roswell, it grounds itself with Andrew. He seems perpetually distressed, running away the day after Fi and Molly leave him with his sister. This leads to a sweet scene with Carey where he convinces Andrew that his sister loves him and that he can’t be homeless if he wants to be okay again. Back at Becca’s house, Andrew reveals what the opening scene showed us, then something it didn’t: Andrew stole a piece of the U.F.O. when his father turned his back for a second. His life has been a combination of guilt (for stealing from the box) and shame (for accepting at face value his father’s stern words on keeping the contents of the box a secret), not to mention carrying around a tiny box that makes him hear voices. Fi gets the box and figures out what it actually is… a translator? And in the final moments, an extraterrestrial actually visits Fi and observes that she “isn’t ready yet.” Ready for what? To meet the spirit of her father, perhaps? In any case, it takes a show wholly confident in its ability to tell stories within its allotted time to take on these two classics. But So Weird has been growing ever more confident since the season started; these two genre-tastic pieces are just icing on the cake.